Tesla' stock held $300 yesterday but has been in a sharp downtrend since doubt surfaced about going private. At some point fundamentals will drive the shares again. Going profitable is much more valuable to shareholders than going private. So while going private could fetch a measly $420, we still think going profitable can get the stock to $1000+ (join to see model). We may be low seeing Ark Investments expecting $4,000 per share. Tesla's stock is for sure volatile so we want to try to build that position at good prices. Building at poor entries decreases confidence in the position. I want conviction to hold to $1,000 but to do that great entries help a lot. Entering at strong entries helps have confidence to keep the position for the long term. 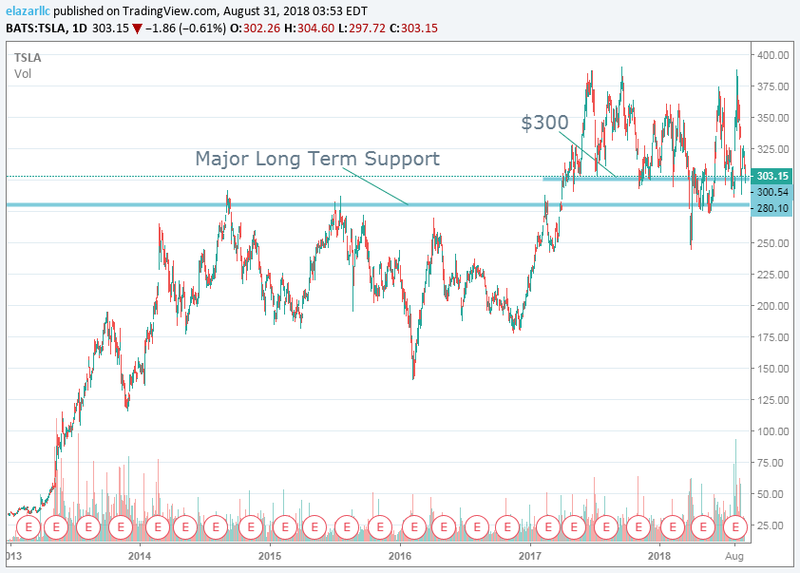 We had noted previously that there's huge longer term support at about $280. Yes yesterday looked like the stock can hold $300 which is a shorter term support. But we'd note that the stock's still been in a sharp downtrend. To add to a position we want to see it start moving up. We don't mind getting in at strong long term supports because we'd expect the fundamentals will take us higher than that level. But even better than strong support levels is we'd simply want to see the stock stop moving down and start moving up. Somewhat simplistic, but it works. We've seen managers go out of business by constantly averaging down. We don't mind lower averages but only if we see the stock moving up. We don't mind adding even higher and missing the low. I'm never thinking I'm smart enough to catch bottoms. I'd rather see the stock move up, which others will then see and that can get things going all over again. Earnings report in October. Production and delivery whispers will become front and center again. The Street seems way too low for $2.90 in 2019 based on our model. We're at over $20.00 for 2019. That's based on the company's plans for 2018 and company comments on earnings calls about 2019. Sorry for the plug but our estimates are ranked highly too. We have no problem seeming way too high. Subscribers know we can be right more often than not. Analysts have been too bearish digging themselves a ditch they can't get out of. Maybe they don't have the experience, not sure, but going profitable is as good as you can get after years of losses. I have no idea why analysts aren't swiveling to accept that this story is about to get much much better. Earnings are what drive stock prices and you're about to get a big swing in earnings as they go positive. I do have an opinion why sell-siders are not swiveling. Sell-siders are also a herd. They want to see stock prices move up rather than have confidence in their work. We have confidence in our work to say that we expect the stock to rise big. But when will the sell-side get aboard? They'll jump aboard and believe in their work only when the stock hits $400 and $500. Then you'll get all the upgrades that the story's suddenly amazing. That's how the sell-side works. But you knew that. They don't get paid to predict very far or very high. That's our opportunity to exploit. I find myself writing about Tesla a lot publicly. I hear myself. This earnings inflection is so big. My whole career I'm focused on earnings. That's what drives individual stock prices. That's what really drives the market; that and interest rates. So when you have a company saying we're hitting earnings leverage as we ramp Model 3s and we're going profitable, why not take heed? I still read many comments and opinions out there that this company is a loss-maker. Ok, rearview mirror loss-maker. They are telling you profit. Nobody, not the sell side, not the bears, not the shorts, believe it. We haven't had a multiple choice quiz in a while but I'm in the mood. Here goes. Let's see who's paying attention. A) Really well articulated short stories from websites with over 30 million unique visitors. B) Really well articulated short stories from websites with over 50 million unique visitors. C) Really well articulated short stories from websites with over 60 million unique visitors. This is a tough one so take your time and think about it. Feel free to answer in comments. Definition: Sell-side= brokerage firms that sell their research.